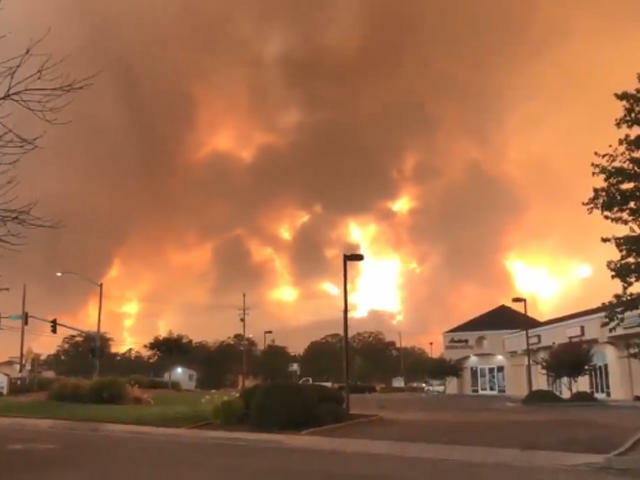 Northern California wildfire turns deadly, forces "mass evacuations"
REDDING, Calif. -- An explosive wildfire raged through several Northern California communities, killing two firefighters and destroying dozens of homes after thousands of terrified residents fled in miles-long traffic jams. Sixty-five structures have been destroyed, and 5,000 other buildings were threatened, fire officials said Friday. The Carr Fire is "taking down everything in its path," said Scott McLean, a CalFire spokesman for the crews battling the blaze. In all, an estimated 37,000 people have fled from the Carr Fire, which began Monday and tripled in size overnight Thursday amid scorching temperatures, low humidity and high winds. Fire officials warned that the blaze would probably burn deeper into urban areas before there was any hope of containing it. Residents in the western part of Redding who had not been under evacuation orders were caught off guard and had to flee with little notice. "When it hit, people were really scrambling," McLean said. "There was not much of a warning." Many fire crews turned their focus from the flames to getting people out alive. On Friday morning, McLean told "CBS This Morning" the fire was "probably" less than 6 percent contained. KRCR-TV in Redding was forced to evacuate its newsroom, CBS Chico, California, affiliate KHSL-TV reports. A KRCR-TV journalist choked up as she reported live updates about the fire before the station had to go off the air later. Two news anchors told viewers that the building was being evacuated and urged residents to "be safe." Late Thursday, crews found the body of the bulldozer operator who had been hired privately to clear vegetation in the blaze's path, McLean said. The fire burned over the operator and his equipment, making him the second bulldozer operator killed in a California blaze in less than two weeks. The Marin County Fire Department said its three firefighters were treated at Mercy Medical Center and were later released. One of them will be evaluated at UC Davis Burn Center in Sacramento, the department said. Five civilians were also treated for fire-related injuries, hospital spokesperson Mike Mangas said, adding that their injuries are not serious. The hospital was evacuating five babies in its neonatal intensive care unit, which cares for premature newborns, and taking them to medical facilities outside of the area, Mangas said. The hospital was preparing high-risk patients to be evacuated but there were no immediate plans to do so, he said. Firefighters tried in vain to build containment around the blaze Thursday, but flames kept jumping their lines, McLean said. "It's just a heck of a fight," he said. "They're doing what they can do, and they get pushed out in a lot of cases. We're fighting the fight right now." Brett Gouvea, incident commander of the crews battling the fire, urged residents to pay close attention to the blaze. "This fire is extremely dangerous and moving with no regard for what's in its path," he said. "The boat docks down there -- all the way out in the water -- 30 to 40 boats caught fire when the fire laid down on top of them last night and burned those up," said fire Chief Mike Hebrard of the California Department of Forestry and Fire Protection. Hundreds of miles to the south, the Cranston Fire destroyed five homes and threatened more than 4,900 structures. An estimated 6,000 people have been evacuated in Idyllwild and several neighboring communities. Brandon McGlover, 32, has been charged with intentionally starting the blaze, along with eight other fires in Southern California.